« The Why’s and How’s to Crate Train Your Dog. We at Dogs Day Inn LLC Cage Free Dog Boarding are always looking for ways and ideas to keep our dogs safe. This idea was listed on PetsPage.Com by the Veterinary Specialty Center of Melbourne Florida. 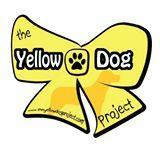 Its called the Yellow Dog Project. The concept is so simple that I am surprised its not used more. If your dog is one that needs its space while being walked you tie a yellow ribbon on its leash. This doesn’t mean your dog is mean, as there are many reasons a dog doesn’t want to be petted by strangers or sniffed by strange dogs. We encourage everyone who wants their dog to have its space to use the simple recommendations listed on their web page, and tie a yellow ribbon around your dog’s leash. A pleasant walk for you and your dog makes for a great time for the both of you, so please walk your dog and enjoy the fresh air.